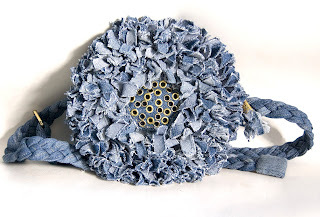 I like the idea of using recycled materials such as jeans in this bumbag and the same idea is in these denim shorts that you can also make from an old pair of jeans. High-waist denim shorts are must this summer, as well as combining denim with denim; like this bag and shorts. This would be the perfect outfit for clubbing in London for example, relaxed, yet glamorous with a sequin top that is perfect top if you have good shoulders and abs to show off. You can tie your clean hair into a tight ponytail as it's not worth using precious time in these hot summer nights for over doing your hair - the whole night of partying in humid summer nights will destroy any complicated hairdos. Labels: bumbag, denim, fanny bag, hip bag, jeans, London, Maria N., Olympic Games 2012, ponytail, recycled, sequins, styling tips á la Maria N.